You will find other scenes from the same location at the above link. 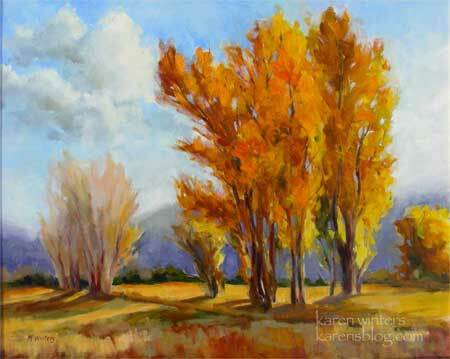 These beautiful strong cottonwoods were an irresistible subject. The painting was one of the ones I took to Descanso Gardens for our holiday show, through early January. I have replaced the two sold paintings (Heaven and Nature Sing and this one) with two others. No empty spaces on the walls. I heard on the news that there is enough snow around Mammoth for skiing – so many storms must be falling on the Sierras. Can a winter painting trip be far away? Oh I really like this – those reds and yellows are gorgeous! Such beautiful, vibrant colors! Nicely composed too. No wonder that sold right away… It is really striking!! Wonderful internet site. A great deal of very helpful details below. I am sending the idea to some contacts ans likewise sharing with tasty. In addition to normally, thanks on your own effort!